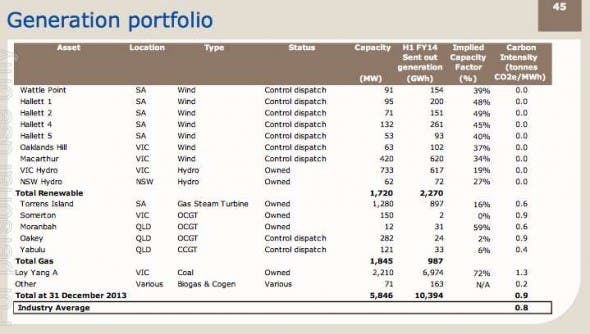 AGL Energy Wind Farms Operating At Nearly A 50% Capacity Factor! AGL Energy says some of its wind farms in South Australia have been operating at nearly 50 per cent capacity factors in the past six months, a very high rating for a wind farm and higher than many coal-fired generators. This graph included in AGL Energy’s December half accounts show that the 95MW Hallett 1 and 71MW Hallett 2 wind farms – both located near the village of the same name in the state’s mid north region – achieved capacity factors of 48 per cent and 49 per cent respectively from July 1 to December 30. The other two Hallett wind farms in its portfolio also got capacity factors of 45 per cent and 40 per cent. Wind energy accounted for 27 per cent of the state’s electricity production in 2012/13, and may well increase this year based on this data. In Victoria, the biggest wind farm in the southern hemisphere, the newly completed 420MW Macarthur wind farm, reported a capacity factor of 34 per cent. This is still fairly solid, although it highlights the seasonal differential for the wind farm. A company spokesman was quoted in a local newspaper today saying its capacity factor in the month of August was more than 52 per cent, and more than 40 per cent in the September quarter. The data shows that 2,200MW Loy Yang A – the company’s biggest generator – ran at a capacity factor of 72 per cent, which appears low for a brown coal generator but may be explained by upgrades to various units. Torrens Island, the major gas-fired generator in South Australia, had a capacity factor of just 16 per cent. Meanwhile, AGL Energy says it will begin construction of its 53MW solar PV farm at Broken Hill in June, the second part of its Solar Flagships project that has already seen it begin construction of a 102MW solar farm at Nyngan. Both projects will be completed in 2015, with Broken Hill due to be finished at the end of the year. Giles Parkinson is the founding editor of RenewEconomy.com.au, an Australian-based website that provides news and analysis on cleantech, carbon, and climate issues. Giles is based in Sydney and is watching the (slow, but quickening) transformation of Australia's energy grid with great interest.